J/C, What if Chakotay had used his Maquis tactics, instead of being so "Starfleet"? Tom Paris had succeeded at breaking the warp-10 barrier, but at what cost? The reptilian creature, that used to be Tom, lay strapped to a biobed in engineering, his DNA being bombarded with anti-protons from the warp nacelles. The Doctor had suggested this course of action to destroy the "mutant" DNA, forcing the helmsman's body to use its pre-warp-10 Paris DNA. Everyone involved with the procedure underestimated the strength of the mutant-Paris. With a little effort he broke out of the restraints, escaping in a hail of phaser fire. In the process many systems on the ship were damaged, including the internal sensors. Upon hearing the security klaxon, Captain Janeway contacted the bridge to say she was on her way there. However, the changed Tom ran into Janeway on his way to the shuttle bay, knocked her unconscious, took her to the Cochrane, and prepared to launch the shuttle. Chakotay had been keeping close watch on the whole process in engineering. A gnawing feeling in his gut told him that things weren't going to go as smoothly and easily as the sometimes overconfident holo-doctor thought. Knowing Paris, the young pilot wouldn't submit quietly. So when the phaser fire began in engineering, and there was no response to hails, Chakotay decided to follow his instinct and took off to the shuttle bay. Arriving just in time to see Paris drag Janeway's limp body onboard, and close the hatch, Chakotay hurried to the cargo transport console and entered his command codes - ones that were not exactly regulation, but the former Maquis captain had thought necessary for such times as this - and overrode the shuttle's defenses. But there was another problem. "I can't get a lock on Paris or Kathryn. He must have erected another kind of forcefield around them." Time was running out for him to figure out how to get the transporter to work. Chakotay slammed his fist down on the console in frustration, as the outer doors opened, letting him know that the shuttle would launch any second. Suddenly his head snapped up as another idea came to him. He keyed a sequence of commands into the console and then dashed over to the transporter pad. A moment later, he vanished. Chakotay rematerialized in the aft section of the shuttle. He began stealthily moving forward until he reached the door to the main cabin, hoping Tom would be occupied with flying the Cochrane. Soundlessly the door slid open and he slipped through, concealing himself behind a chair at one of the rear stations. Tom didn't turn his head. So far so good. His reptilian body was bent over the console as he entered the necessary codes for the jump to warp 10. Looking for Kathryn, Chakotay swept his gaze around the cabin. He finally spotted her, reclined in the chair at another duty station. Still unconscious, she didn't move as he quietly crawled along the floor toward her. When Chakotay reached her, he extended his hand toward her, testing to see if the field around Kathryn was one he could get through. After successfully touching her shoulder, he tried to wake her up as gently, and more importantly, as quietly as he could. After a moment she groaned and moved her head. Her eyes open and she blinked and looked at him. He held his finger in front of his mouth, warning her to remain silent, and silently offered his hand to help her leave the chair. Chakotay intended to call for a beam-out as soon as he could get Kathryn away from what was preventing it. Kathryn nodded as she gripped tightly to his other hand and began to rise, but the shuttle went to warp 10, and the universe changed around them. Acting Captain Tuvok and the crew of Voyager searched for their missing command pair and pilot for three days. On the third day, they found the shuttle on the fourth planet of an uninhabited star system. After ordering a thorough search for the exact location of the shuttle, Tuvok went to sickbay. "The DNA of Lieutenant Paris and possibly now the captain and commander as well, have begun evolving. Perhaps this evolution and its rapid pace are caused by the exposure to infinite velocity." The Doctor briefed Tuvok on his conclusions after he had gone over all of his data. "When we are able to locate Lieutenant Paris, how do you think that you will be able to reverse the mutation?" Lieutenant Tuvok asked the doctor. "I believe that the anti-proton regime will work. I will have to increase the intensity and duration of the bursts." "Bridge to Lieutenant Tuvok." Ensign Kim's voice interrupted the conversation. "Tuvok, here. What is it, Mr. Kim?" "We found the shuttle in the jungle near the planet's equator." "Have a security team meet me in transporter room three. Tuvok out." It was nighttime when the security team beamed to the coordinates of the shuttle. The air was warm and heavy with humidity, making it uncomfortable for the group as they hunted for the missing crew. Keeping the shuttle as a starting off point, Tuvok ordered a thorough search of the surrounding area. Taking Lieutenant Ayala with him, Tuvok headed toward a body of water about 200 meters from the small craft. After pushing past huge ferns and other jungle plants, the two finally reached the bank of a still pond. Using their Sims beacon, they discovered evidence of recent animal movement in the area. "Lieutenant Tuvok!" Ayala exclaimed. "Over there." To the right, half on the bank and half in the water, were three large creatures. They looked to be amphibian, though Ayala thought they looked like a cross between a slug and a crawling catfish. Two of the animals were crouched very close to each other. The third that was off to the side by itself looked injured, with scratches that were still seeping blood. When suddenly the one of the pair came at the two Voyager crew, Tuvok stunned it and then the others. After scanning the creatures with his tricorder, he reported, "There are signs of human DNA, though I'm not sure which one is the captain." "I would say, the female." Ayala's grin was obvious even in the darkness. Before they would ask for a beam-out, they heard a faint chirping as three tiny versions of the animals scurried over to the unconscious bodies of the two adults and began to nudge them and rub against their sides. Tuvok raised his eyebrow. "I'm not sure how I will enter this into my log." "I'm sure that the Captain will find it entertaining reading." After a few moments of contemplation, Tuvok choose to stun the offspring and beam the whole lot to sickbay. It seemed to him that to leave the three small ones would be a violation of the Prime Directive and would be detrimental to the well being of the youngsters since they were still too young to be separated from their mother. Nothing made the doctor more snug and self-important than accomplishing a task that no one in Starfleet had before. He smirked as he ran his medical tricoder over the once more fully human Captain Janeway. "Even though I don't expect any more problems, I would like you and the rest to stay in sickbay for the next three days." After Kathryn nodded, the doctor said, "Now I have to take care of Mr. Paris' wounds. He seemed to have been the loser in a good fight." Chakotay had been sitting on the biobed next to the captain's. "What about the children?" he asked. "They're fine," the doctor answered as he motioned to three small crib-like biobeds. "All three will need to rest as well, but I am confident that they will have no after effects of the DNA reversal. They had good genes from both you and the captain." "I hope that Tom will be okay, too." Chakotay was concerned. "I don't remember fighting him." The doctor chuckled knowingly. "In fact, you didn't. I found the captain's DNA in the scratches and Tom's DNA on the captain's former claws. 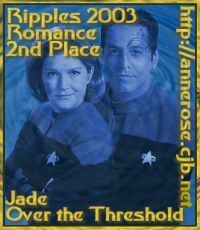 I would say, Captain Janeway was the one who fought off Mr. Paris' advances. It would appear that the female of the species made her feelings known." Seeing that his news had the desired affect, he walked over to where Tom was lying and began working to heal the pilot's injuries. Jumping down from her biobed, Kathryn moved close to the high tech bassinettes. A look of sheer awe crossed her face as she looked down at the sleeping infants. The two boys and one girl were chubby and healthy human babies of about eight months of age. Unable to control herself any long, she reached out her to touch the soft, brown hair on each head in turn. "Chakotay, they are so beautiful!" she exclaimed in a choked whisper. In a low voice, Chakotay spoke, "They are beautiful, like their mother." He took another breath. "I don't remember much of our life down on that planet. I feel like I need to apologize for my conduct." Kathryn raised her hand it interrupt his speech. "According to what the Doctor said, I was a willing participant and as in some species where the female takes the lead, may have initiated mating." The look on Chakotay's showed relief and then something more. After a few seconds of looking for the right words, he said, "I've always been an old fashioned man at heart. In my tribe when two people have children, they marry. I want to do the right thing for you and our children." Kathryn said, "I've always wanted to have a family." She blushed. "And if I were honest..." She looked up at Chakotay, with uncustomary shyness. "Ever since you appeared on my bridge, I've had these fantasies about it being with you." Chakotay took a deep breath and closed his eyes. When he opened them, he looked at her. "Does that mean you'll marry me?" "Does that mean you're asking?" she replied. Kathryn snuggled into his arms. "Then it's decided." She looked at their children. "I'll have to turn over command of the ship to Tuvok, so he can perform the ceremony." "He's already in charge, until we're released from sickbay." "Perhaps we should speak to him about it, the next time he comes down to check on us," Kathryn said. They chatted a little about baby names. Kathryn said, "I have no idea how to come up with names for three children." "We can ask the Doctor. I think he's the one making a complete study of human names." Pulling Kathryn closer to him, Chakotay sighed, "I wish could remember more about our time on the planet. I had always imagined that making love to you would be unforgettable." "Don't worry," she whispered as she lifted her mouth to his. "Next time you will remember."